The term e learning indicates products that differ very much both in services supplied and in design. E learning platforms do not necessarily involve networking as a fundamental component. However, networking is important both to ease access to course material and to support interaction among users. Networking should be exploited to allow remote access to students who cannot be present at lessons, to allow asynchronous learning whenever students have time, to supply users with tools for cooperative learning regardless of their physical location. The spread of wireless networking technologies and their standardization will lead to innovations in all three of these aspects. 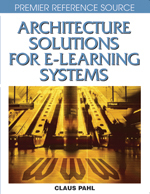 This chapter focuses on the services whose deployment computer networks make possible in order to boost interactivity, cooperation and involvement in learning, with specific attention to ubiquitous learning and for the impact of wireless technologies on the general framework.